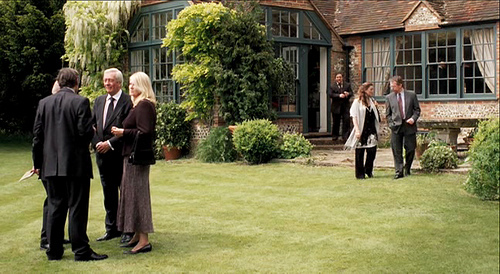 For the 2007 British farce Death at a Funeral, director Frank Oz says it was important to find the perfect English Country house where the family and friends would gather. Luckily, the first one they saw was this ivy-covered home in Henley, an hour outside London, and it was so beautiful, he says, that they knew they didn’t have to look any further. 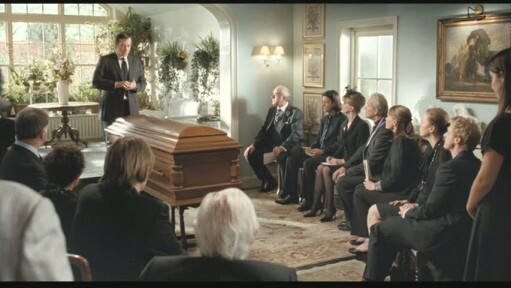 The movie, written by Dean Craig, is about the people who come together for a funeral service. Daniel is in charge of organizing his father’s memorial, but his efforts to keep things dignified and respectful are in vain. Things start off badly when the funeral home delivers the wrong dead body to the house and go downhill from there. It’s a farce, so there’s lots of wackiness and unexpected turns of events, but I was busy staring at the sets. Frank Oz says that the interior of the house in Henley wouldn’t work for the movie, so they built the sets on a soundstage at Ealing Studios (London). Michael Howells was the production designer. He also worked on movies like Emma (1996) and Nanny McPhee. A question for my U.K. readers: Is it common to hold funerals at home like this? Or is this just a movie thing? It was Matthew Macfadyen–the actor who played Darcy in Pride & Prejudice! He looked so different and played such a meek and nervous character in Death at a Funeral that he was practically unrecognizable as the same person. The woman who plays Daniel’s wife Jane is Keeley Hawes. Macfadyen and Hawes are also married in real life, and they were expecting a baby boy during filming. This bedroom is one of the only rooms that is actually in the house in Henley (not a set). You can see more photos from the movie at Sweet Sunday Morning. I was so wowed when I saw the house on her site that I had to see the movie myself! P.S. Visit Houses Onscreen to see more! Can You Name the 10 Oscar-Nominated Films These Houses Starred In? Julia, This was such a funny movie…I remember looking all over the house while watching it….the decor, the accessories, there was a lot of eye candy…and the grounds of the house…maybe I was meant to have a country estate. I seriously think wisteria makes almost any house look inviting! .-= LoveFeast Table´s last blog ..Bloggy Bootcamp in Baltimore =-. .-= Katie´s last blog ..It All Starts With One Tiny Little Crack In The Wall… =-. This was a f-u-n-n-y movie with a wonderful cast. Little formal for me…but the outside is uber charming. .-= Becky @ Farmgirl Paints´s last blog ..Special somethings… =-. I enjoyed hearing that you often miss the plot or story line because you are looking at the house. I just said the same thing in my last post. Thank heavens for Tivo and DVD’s that you can zip back, freeze frame and study to our hearts content. .-= Pamela Rosenberg´s last blog ..Spaces That Inspire or The House of Sally =-. i will have to see this movie! oh and is just saw An Enchanted April…great villa there too! In my experience this is a movie thing. Usually a crematorium, sometimes a church, occasionally both, church first. These days the nearest the coffin gets to the house is when the hearse arrives and everyone gets into cars and follows the hearse to the crematorium or the church. Although these days this is, I think, becoming less common because of not wanting to advertise the fact that the house is empty because everyone has gone to the funeral, burglars’ invitation. Funeral Directors will, for a fee, arrange security at the house. Certainly for my parent’s funerals the hearse, on each occsion, was met at the crematorium gates and only followed up the drive. What a great house! I missed this movie, I think I need to go to my library today! Death at a Funeral is hilarious. An absolute gem of a movie. I cannot imagine how badly it will be remade. I haven’t seen the movie but this makes me want to check it out! .-= Lesley @ The Design File´s last blog ..Beautiful, modern nursery in an urban condo =-. Thanks for this one, Julia. This was such a fun movie but what I most remembered about the house were the bathroom and the roof! It’s nice to get a look at the prettier parts again. .-= Tracy @ Comfort&Luxury´s last blog ..Sunny Mood Board Monday =-. Now this is my kind of house! I never saw the film but Netflix here I come. Thanks for the fun, Julia. .-= Jane F @ Atticmag´s last blog ..Retro Cottage Green Kitchen =-. I love the wall color in that first shot of the interior! .-= Amanda @ Serenity Now´s last blog ..Signs of Spring: Easy Blueberry Streusel Muffins =-. I featured that house several months ago and I just love it. It’s so English Country. Great post. .-= Jessica at LAvender and Lilies´s last blog ..The Picks =-. 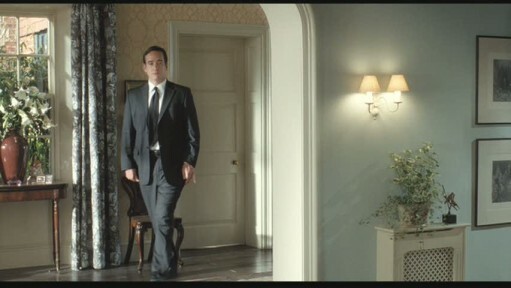 I had the same challenge recognizing Matthew MacFadyen when I saw “Death at a Funeral” — how did I know him? I had to google the cast of the movie to finally figure it out. And then, of course, I swooned. Pride and Prejudice is my favorite movie. He was fabulous in it. But, like you, I didn’t even realize it was the same guy. Love him more as Mr. Darcy. Have never heard of this movie…or of having a funeral in the house…which seems really unappealing. But, the house itself is amazing! .-= The Zhush´s last blog ..The Essence of Nostalgia =-. 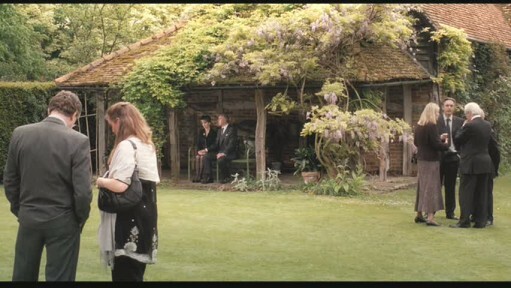 I love the exteriors on this movie. .-= Valerie´s last blog ..99 Things =-. I love this movie! LOVE IT! I checked it out because it had Matthew McFadyen (swoon) and Alan Tudyk, who I would watch stand on stage and read a phone book. I can’t believe they are doing a remake. WHY? WHY? WHY? I’m sure it will be all slapstick and lack all the subtle dark humor of the original. Also, there will be no Matthew McFadyen. .-= Mom in High Heels´s last blog ..Giveaway!!!! =-. Hi – I’m from Ireland and here it is still quite common to bring the body to the house the night before the funeral so that people can come and say their respects. 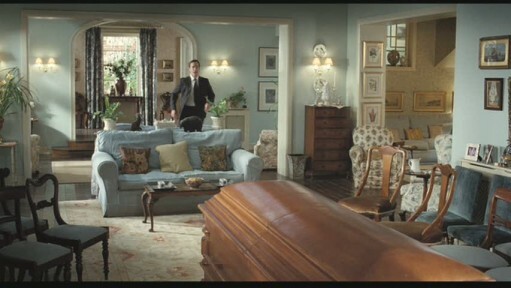 The body is either laid out in the coffin in the main living room or sometimes it is laid out in the bed in the bedroom. I have only been to one funeral at a funeral home, and this was because the person who died was being buried in a different town to the one he was living in before he died. Also, I might add that when I was younger, I was on an exchange with a family in France and one day, while I was school, the Grandfather died. They weren’t able to tell me before I came home and walked into the guest room I was using to find his body in my bed. It was terrible!! I got such a fright and then I had to go and stay with another family and never saw those people again! I think the garden shed thingey is an arbour (spelt the English way). It doesn’t fit ‘pergola’, I think a ‘veranda’ is part of a house while this is part of an outbuilding, and ‘lean-to’ doesn’t do it justice. Whatever it is I want one. .-= Tricia Rose´s last blog ..Home =-. I love this house. I might just have to see this movie. I wonder if the ivy attracts bugs or insects. Lets hope not. This house has my parents written all over it. They are obsessed anglophiles and this house looks tailor-made for them. We had my husband’s grandmother’s casket in her home. It was a small, intimate gathering of family and friends the day before we had the funeral at the church. In older houses (with narrow stairways) there is often a “coffin corner” which is a niche to create enough space for the coffin to turn to get it down the stairs. I’ve read that that’s a myth, but have been on house tours that have referred to it. Maybe more than you wanted to know! .-= Marcy´s last blog ..Blog Star… Twice Remembered =-. The “coffin corner” IS a myth! Don’t believe everything you hear on house tours: take it from me I’m head guide at a house museum. Stories like these often start with one tour guide who comes up with a spurious but fun answer to a visitor’s question. The story gets passed from guide to guide and house to house. These myths are virulent and very very hard to get rid of–people like them because they’re more fun than the truth. Other prevalent house myths include “fainting couches”, “closet taxes”, “petticoat mirrors”, “furniture is smaller because people were so much shorter back then”. Those niches in tight stairwells DID help in moving all kinds of furniture up & down the stairs, and served as attractive shelves for vases of flowers, etc. Generally, funerals & wakes were held in the public rooms of houses–on the lower levels. No need to haul a coffin up & down stairs except perhaps if you lived in a tenement house. I thought this movie was pretty darn funny. I remember loving the house and the grounds too. Mr. Darcy…I never even paid attention to that. Interesting. .-= Carmen´s last blog ..Front Door Freshened Up =-. 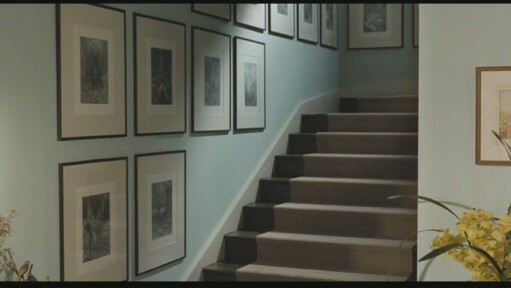 Love the art on the staircase and I just have a “thing” for ivy on houses! Sigh! Great recap! .-= Jess @ Frugal with a Flourish´s last blog ..Mood Board Monday – Bright Whimsical Dining Area =-. The outdoor structure is called a summer house, I think, or a gazebo. They always remind me of the Sound of Music where Liesl sings “Sixteen going on seventeen” to her boyfriend. Hi Julia – yes I watched the awards over here it was from 12pm to 4pm very long I needed a nap after that you poor girl. I have this movie but have not watched it as yet but now I’m going to have to it looks great I agree with you the art work looks good, I don’t know if you have seen a movie called The Wedding Date with Debra Messing it is filmed in the UK if you haven’t please give it a go because the country side and village is very beautiful. Regards Esther from a much cooler Sydney.. Yes – still a tradition here in N Ireland to have the coffin in the house, and either the main funeral service in the house, or a smaller private family service before leaving for the church/graveyard. Never heard of this film – must look out for it. .-= Janmary, N Ireland´s last blog ..Mothers Day Treats =-. Room With A View is my favorite movie of all time (and spent my college years pining for Rupert Graves), and I also love Enchanted April….I guess you’ve seen that too? Love seeing both Matthew and Rupert in Miss Marples on PBS! 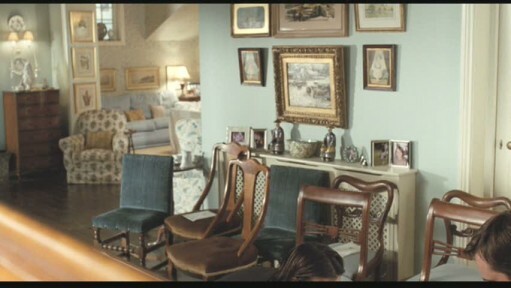 I love the house in the American version even better. Very dark but stunning wallpaper – its virtually the same movie plot with an American twist. I love the UK version for the actors but really love the house in Chris Rock’s version. I do have a question and I hope someone can help, Is the house in Chris’ version a Frank Lloyd Wright house? Sure looks like One. Thanks! Hi, quite often the viewing of the body was in the home so that family and intimate friends could pay their last respects in privacy and a friendly setting. This happened with all of my grandparents. The undertakers then took the deceased to the church for the service. The interring of the body was for family only and about 5 invited guests. Mind you, this happened in villages not in a large city so it might be different there. I thought it was beautiful sending off a loved one from their own home.